Well, today officially marks my one year anniversary in Santa Fe! How. In. The. World. has one year passed?! This has been a phenomenal one - probably the most important year to-date. The amount of growth I've experienced truly can't even be put into words. Let me just tell ya, moving to a new city all alone is no easy feat. Had you told me this is what my life would look like five years ago, I would have laughed and never believed you. Boy am I BLESSED. It's so easy to focus on all the things that aren't perfect in your life and ignore all the things that are so wonderful. Trust me, I struggle with this on the daily. But, dang. I have a loving and oh-so-supportive family, a pup I adore and couldn't imagine life without, the best of friends, an incredible career, access to amazing opportunities, and the list goes on. I am grateful - and constantly trying to stand in the peace of God's presence. Over the last year, I've done things I've never done - gone places I've never gone - seen sights I've never seen - and been who I never knew I could be. Man, this just brought tears to my eyes. Does my life look the way I thought it would? The way I envisioned since I was a little girl? No. Not even close. But, would I change a thing? Absolutely not. This was all a part of God's plan and who knows better about what's best for me than Him? I hope you have the courage to step outside your comfort zone. To take chances, take risks. Believe in yourself. Never stop dreaming. Why? Because oftentimes, you're the only one holding yourself back from the life you WANT to live. The life you CAN live. Also, this tank comes in 4 other colors and is under $20 - sandals are RESTOCKED in all colors and sizes for under $15 (a legit steal!) and jeans are some of the most comfortable I own (wear them more often than I care to admit). All the boho feels in summer months. Well for me anyway because I wish I could be a full-time flower child ;) Plus it's been HOT! I moved from southern New Mexico thinking I would be able to enjoy cooler summers and more intense winters (yes, I was hoping wishing praying for a snow day this year) but it's been none of the above lol it's okay, I love it anyway. This weekend I spent lots of time adventuring with my family. Going places that are - no joke - less than an hour-ish away and so easy to get to. Magical wouldn't even do either place justice. Bandelier National Monument is crazy beautiful. No words for the cliff dwellings and petroglyphs. Simply stunning and so happy I got to experience it for the first time with my loved ones! We were fortunate that it was overcast (because our intention was to be there by 9 but, as usual, it was my fault that we didn't get there until 11). It would be way too hot on an ordinary summer day to do it any time other than when they allow visitors to begin entering at 9:00 a.m. We saw so many critters (I'll do a post on my "Experience the Southwest" tab that shares more about the experience sometime soon) and were truly fascinated by the human presence tracing back over 11,000 years! We also went to El Santuario de Chimayo, a small church in Chimayo, New Mexico. It's located between Santa Fe and Taos and is quite possibly the most peaceful place I've ever been. My family has been going for years, but this was my first time. I can't put into words how I felt being inside the church and in the room with Holy Dirt. I'll share more (in the post referenced above) because the experience was powerful to say the least. I'm already looking forward to the next time I can make it back! So, with that being said. Can't experience summer in the Southwest without some good Art.i.fact pieces in your closet! How about this leather fringe top that is made of Southwest dreams. Seriously, I am totally in love with this top and might not be taking it back - just sayin. The detail and open back make it a pretty exceptional piece. So many ways to style it and just a top that screams fun. THIS SKIRT - swooning over here. Vintage Gucci and totally awesome. Unlike any skirt I've ever seen before. The prettiest orange and such a unique pattern (there's a matching sheer top too - was a little too much for me to wear it all together). Contact Jennifer for pricing on these pieces via telephone (505) 982-5000 or DM @artifactsantafe on Instagram. Also, hat is super cute and I got a lot of compliments on it. It's staying in my closet, because let's face it - I'm a total crazy hat lady. (see what I did there...) Was $14, just a testament to the great deals you can find on classic pieces at Art.i.fact. Okay, okay. I wasn't totally sure about this polka dot jumpsuit when I picked it out but I've absolutely changed my mind. I don't just like it, I LOVE it! Flowy and free - my kind of lil boho numba. Plus the open back is on point. Actually doesn't really matter how tall/short you are because it'd be just as cute as long pants as it is kinda high-water looking on me (I know, high-water has a negative connotation but I actually like things that fit this way). Snag it before it's gone because it won't be available long. The team at Art.i.fact is waiting for you to call :) don’t forget you don't have to live in Santa Fe to make purchases. They ship nationwide! 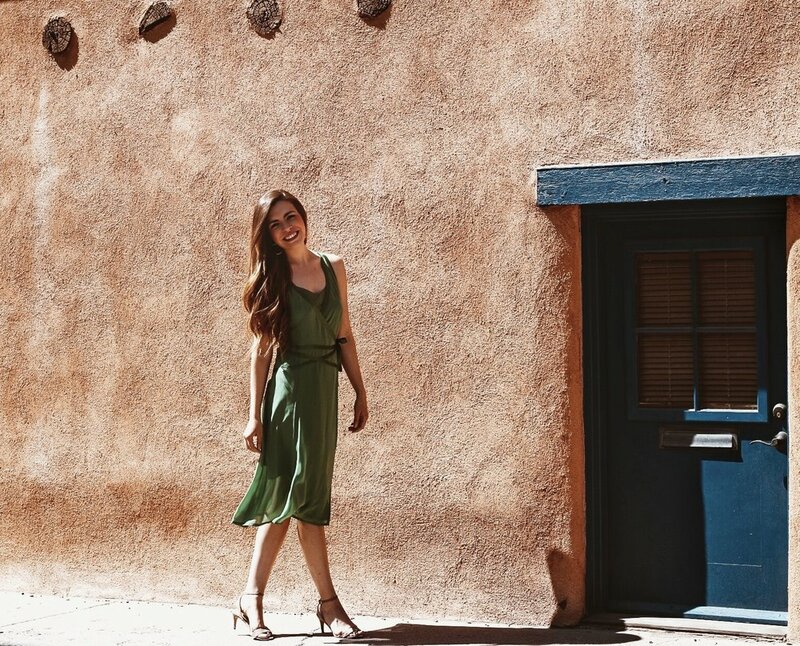 Time to get your lil boho self all the things for summer in the Southwest - enjoy, my friends! Ever found jewelry that you feel like just fits your personality, style, aaaand you have a hard time narrowing down your options? That’s how I feel about Heliconia Jewelry! Gloria, who handcrafts each unique piece, is incredibly talented and has the most amazing eye (check out some of the turquoise pieces I’ve styled... all the heart eyes). Stones are one of a kind, meaning that no two earrings, rings, bracelets, etc are the same - my kind of accessories! I have an affinity for unusual, unique things. Not to mention, Gloria's creativity is unreal. Her designs are unlike any others I’ve seen around. And I’ve seen lots of turquoise + creative designs in Santa Fe. There’s just something special about her pieces. They're delicate and eye-catching. Simple yet so complex. The kind of jewelry worth investing in. Naturally I was stoked about the opportunity to collaborate! I think when I started out blogging I used to get excited about any collaboration opportunity, but I've become much more selective. I want the products I feature to be truly representative of me and my style. So, of course, I couldn't wait to photograph all of these amazing pieces and share them with all of you! First, this necklace is one of my all-time favorite pieces. There is just something so unique about it. I liked it when I picked it out - a week later, I LOVED it. Because, it just goes with everything. Again, simple but so detailed and quite lovely. These earrings - they don't even need words. Got a TON of compliments. I mean, a ton. They're under $100 and the kind of pieces that will never get old. I'm quite confident they'd stay in your jewelry rotation about as long as you're on this earth. And, I think they'd get passed down to future generations (the kind of pieces your great-grandchildren will treasure and adore). They're that beautiful + delicate. Okay, okay. This bracelet is stunning. I've never, ever seen a stone like this. Pink + green and oh-so-fabulous! The kind of accessory that has you covered - no need to wear flashy earrings or the perfect ring(s) because this one piece is simply enough. Paired with basic looks - solid whites, blacks, tans and grays - truly, can't go wrong. Nobody could ever have enough Heliconia rings. This mint-colored stone is unreal. Kinda big, kindy statement-y and I. love. it. While bold, it's actually so easy to style and pair with both solid and festive prints. Again, an heirloom pieces that you and future generations will cherish. Last but not least, this 3-piece set that is crazy gorgeous. Inspired by Gloria's homeland. The semi-circle pattern is consistent throughout the collection and symbolic of the ancient Andean cultures. Worn all together or separately, you're going to get so many compliments. If you like unique designs, this is the set for you. My followers can get 10% off their order through June 30th with code SOMEWEARSOUTHWEST. Hurry, hurry to snag your favorite pieces with this awesome deal! Make sure to check out Heliconia on Instagram to stay up-to-date on new collection releases + schedule appointments with Gloria to view the pieces in person or find out where she'll be at next! Hey, yall! Whew. It's been a hot minute since I wrote my last blog post. I have barely had to time to breathe lately (and I'm tryna take deep breaths because my travel schedule is bout to get INSANE) These are good things though - things to be grateful for - but I get a little stressed from time to time trying my best to find balance. Is balance ever really attainable? Or is it like a finish line in life that doesn't really exist? The pursuit is meaningful nonetheless. For me, it keeps me in check - makin' sure I'm hittin' up the yoga studio (my favorite in town is Thrive, btw), regularly walkin' my lil guy, Bensters, and fittin' in Jesus and family + friends. Ya know, the important things. So finding the quiet head space to write has its challenges. But, here I am WRITING and I'm grateful to have had some down time today (more deep breaths before the chaos of the week begins). So. Dang. Talented. He had a vision of the kinds of shots he wanted to capture and we made that vision become reality. Walked 4 miles in a dress and sandals (not knowing the adventure I was in for lol) and it was worth every blister on my foot. Literally. Alright, I had my eye on this tie-dye, flowy dress for awhile. And, when I went to pick out my looks for this month I couldn't believe it was still there! Size medium and wasn't sure it would fit but I gave it a go and I'm so glad I did! Love, love the way it hung off my shoulder. It's lightweight and oh so perfect for summer. Luna Luz dresses are upwards of $200, so you're getting your money's worth at $89. So, there ya have it. My wonderfully beautiful adventure with Mark Gowen and amazing 'steal of a deal' pieces from Art.i.fact. DM Jennifer (@artifactsantafe) on Instagram or call their store if you're not from 'round here ;) They ship nationwide. Ps, happy late summer solstice (I got to celebrate with sangria and song - YAY) hope yours was perfect too! Okay, well technically I guess they're an oxford - but they feel and look like tennis shoes to me. Meaning, they're super comfortable and I'm going to style them as such. The perfect airport shoe? I got you. Seriously guys, Rockport is known for their comfy shoes and they've really done a great job of matching comfort + trends. "We put ourselves in your shoes before putting you in ours"
I love that - I mean, this is definitely a brand I can get behind. I've spent too many years sacrificing comfort for cuteness and I regret my decisions every day (cry face). But really, I have some war wounds on my feet from a stiletto or two - and, unfortunately, they're not going anywhere. Butttt, doesn't mean I have to take on any more. And, with Rockport, I don't have to. The cool thing is that Rockport is really a cross-generational brand. They have shoes that I'm in love with but also can see both my mom and granny in some of their shoes too! Isn't it great to find a brand that somewhat follows you through your stages of life? So, moral of the story is that - if you're in your 20s, like me - you can still plan to wear Rockport shoes when you're a granny... hahahaha. 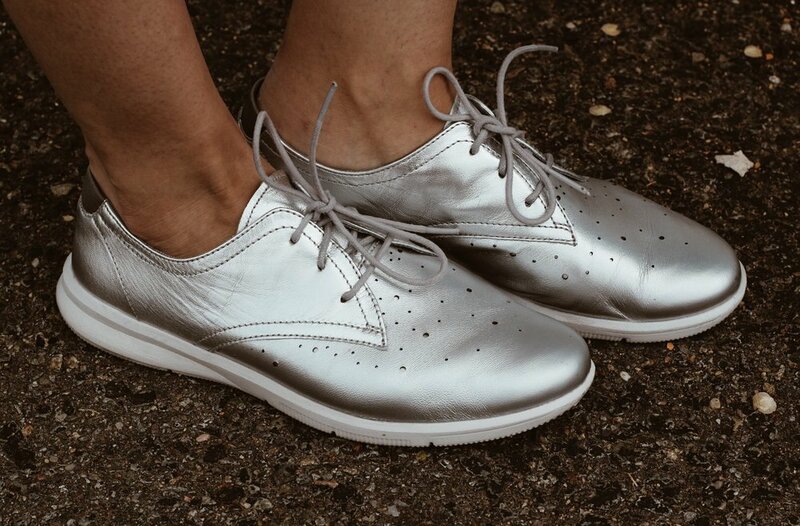 The first time I wore my Ayva Oxfords I went to the Farmers Market, walked around a mini outdoor festival, and through the plaza area to grab lunch - my feed didn't hurt at all and I had the shoes on for a solid 6 hours! That basically never happens to me - try as I might (which is why I end up with ugly blisters and can typically only wear flip flops for the following three days). Perhaps I'm the only one that thinks I'm funny? My mom and grandparents laugh at my jokes. I'll take it. Well guys, that's what I have to say about my new favorite OXFORDS. If you're looking to invest in a new kinda fun / kinda casual shoe, this is it. I'm planning to wear these shoes to the airport from here on out, just sayin. Well, Art.i.fact does it again - and again, and again. Literally never disappoints. Except your wallet, your wallet might be a little disappointed but your closet will not. However, you always get your money's worth. Amazing pieces + great prices = sign. me. up. Alright, this Isabel Marant tunic honestly came home with me. Had to have it. Aaaand I'm so excited to style it different ways - although I was pretty happy with this look. Paired with faux leather leggings and my favorite lace up heels, was feeling like a million bucks. Prime example of the really stellar pieces Art.i.fact has in stock on any given day. It was 89 dolla, holla. Okay, next. This Stella McCartney top is what summer dreams are made of. Delicate and different - right up my alley. For $59 (size small/medium), you're getting a steal. I can imagine styling it a zillion more ways, so if you snag it and need some tips, HMU. It truly is so perfect for a summer vacation. I'm thinking night out near the beach, ya feel? Stop. Seriously, stop. This Nat by Natalie Martin dress is everything. 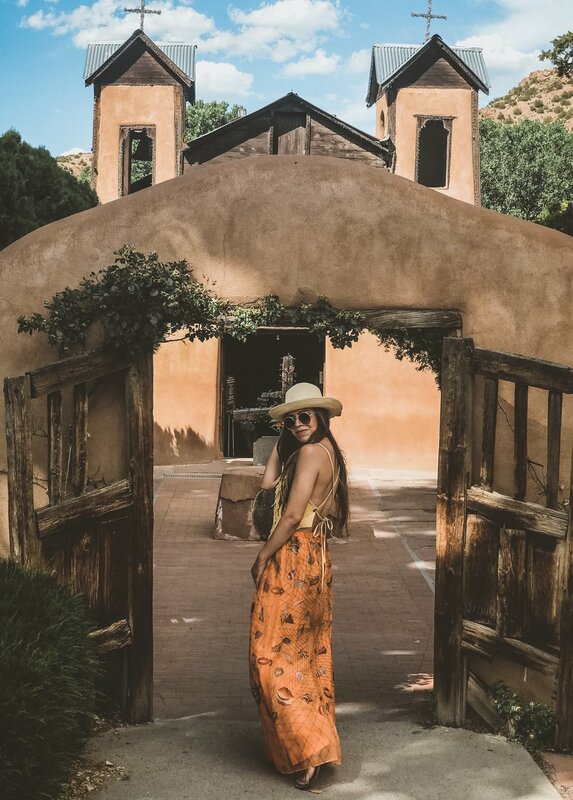 It was all kinds of boho, Santa Fe vibes in this lil numba. Lightweight, comfy and floral. Can't forget the floral. I'm a big fan, just in case you didn't know. Size medium and $69. This was the first time I had been exposed to this brand. And trust, it's gonna stay on my radar because I need a few pieces in my closet. Alright y'all, this Sandwich dress is NWT. That's right, seriously never been worn. Brand new. Fresh ta death. Jk lol you get the point. In the time I had it on, I got a number of compliments. It's one of those classic pieces that is so easy to pull out for a cocktail reception or semi-formal event. Flowy and feminine, just can't go wrong. Size small and $69 - snag it fast! Another month, another Art.i.fact post – and you know this place is my favorite! So much goodness that I really couldn’t limit myself this month. Found so many fun, versatile pieces that I just had to share! I’ll start out with this green-ish halter dress. I mean, c’mon. So cute right?! I paired it with some western vibe booties and a denim jacket, but could easily wear it with flip flops for a day on the beach. Really great for transitioning from spring to summer. Lightweight and feminine, just what I like. Next, this denim patchwork jacket. I. LOVE. THIS. JACKET. Seriously. It’s kinda funky but super fun and goes well with almost anything – over a dress, with a white tee and faux leather leggings, ya know all the things I like to wear on the reg. This is one piece that I didn’t want to take back butttt that means it’s still available for you! It’s Cynthia Ashby and is a steal of a deal at $95.20 – woohoo!! Diggin’ this striped Zara dress (or anything striped for that matter). So comfy, so cute. It’s great for warmer weather but can be worn on a semi-cool day layered with a trendy bomber (as styled here). Because of its versatility, now is the perfect time of year to pick up a piece like this. It just went down in price to $22.40. Snag it before it’s gone!! Okay, gimme all the white button ups! I seriously could never have enough. Long ones, short ones, tall ones, small ones (okay lol I went a little too far) but for real. A top like this won’t disappoint and is a perfect example of the really awesome clothing you can find at Art.i.fact. Jennifer has a great eye for classic, timeless pieces. So, I never care “what season” something was from because honestly – does anyone even know the difference? So, it’s that time - time for me to share some pieces I’ve been loving from Art.i.fact and a couple pics I took with an awesome photographer (s/o to Morgan Hayes) in Atlanta! As for this red DVF dress - it’s perfect for fall/winter and great for work. Though I would gladly wear it to a cocktail party on a weekend 💁🏻‍♀️ I’m all about purchasing things that serve dual-purpose. The pattern is fun and it’s very comfortable, win-win. At $74, it’s a super good deal for a DVF dress. A black scarf will never do you wrong. Especially a quality one like this Eileen Fisher scarf. Quite honestly, I wear scarfs almost every day and my most worn scarfs are a solid print - they just go with everything! This one is multi-season and I really dig the texture. Again, a great deal at $68. Lastly, I told you guys I can never make it out without purchasing something for myself. This hat just had to come home with me. It was originally $300 - still had the tags - and I scored it for $68! I’m tellin ya, Art.i.fact truly has some of the best items I’ve ever found at a luxury consignment store. So many things that are brand new! So, if you just can’t live without this vest, dress or scarf give Jennifer a ring at 505-982-5000. We’re also working on a fun project so make sure to check out my story on Instagram on Friday for a sneak peek! So, I’m sharing my three looks from Art.i.fact this month and I can’t tell you how much I love these pieces. If I could live in velvet, I would. Oh and oversized anything, but that’s another topic for another day. 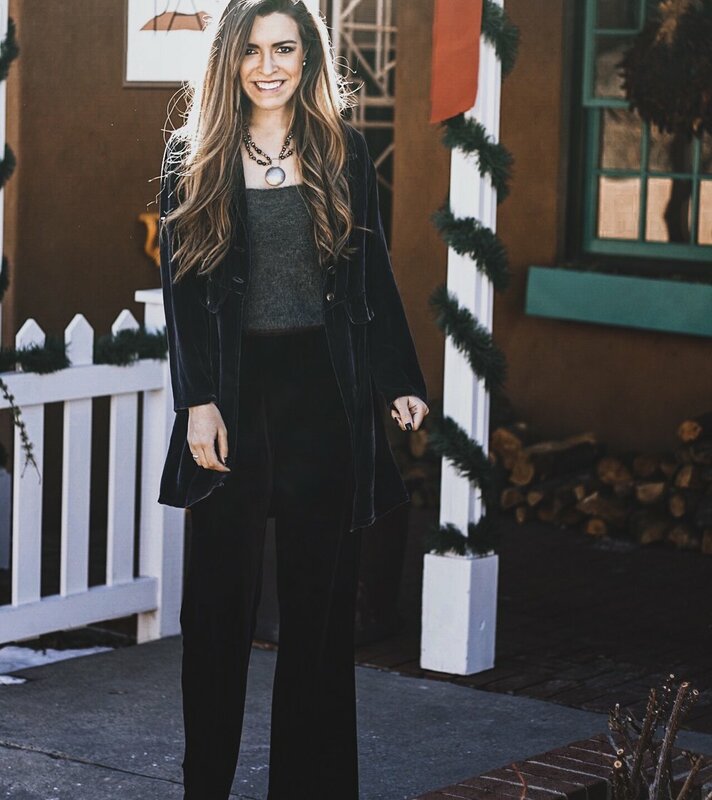 These wool lace up pants are fantastic for the working woman that has a sophisticated vibe but still likes to keep it fun! They’re actually a size 8-10 but they fit my waist like a glove (for sizing reference, I’m typically a size 0-2). They’re Dorothee Bis and $149. And, best part about it is that I find as many work pieces as I do fun! While I enjoy classy, timeless work attire - I can’t help myself when it comes to funky, unique pieces that pretty adequately fit my taste and personality. So, this month I’m sharing a little bit of both. Starting with this fab Max Mara suit that is like ALL THE HEART EYES!!! And it’s warm y’all.. I’m always cold so this is a really big selling factor for me 😅 I typically wear a size 2, this suit is a size 6 and fit like a glove. The cashmere sweater was for sale also but I couldn’t let it go so it now lives in my closet. Oops! But it’s just a testament to how great Jennifer and Michael are at selecting the perfect pieces for their store. The jacket is $96 and the tweed trousers are $69. This cool necklace is also for sale - message me for deets! And lastly, quite possibly my favorite two-piece set of all time. Seriously. I’m still dying over how gorg it is. Are you miss fashionable and a little daring in your non-work looks? Ehemmm, this. This set is for you. The colors, the fabric, the cut. Nothing but love for this retro, chic combo. If you’re interested, let me know and I’ll send you the info you need. But remember, all of these pieces are a one and done. You gotta moooove woman! There ya have it! My picks from Art.i.fact for the month of November 🙂 super excited to share that I’m also partnering with Art.i.fact on a styling workshop - more soon - and, be on the lookout for deets on some try on sessions we’re going to be doing in the near future!